You read about RAP  to be able to do pretty much that is possible with RCP, and thus, decided to provide a web version of your eclipse plugin. So, you install and setup the RAP tooling . You change your target platform to compile against the RAP runtime. Several compile errors arise. 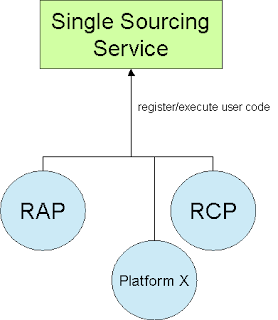 After some research you read about RAP not being fully compatible with its RCP counterpart and that you will have to apply single sourcing techniques to get your plugin work on RAP. As you might know, RAP does not support mouse move events, and thus, this has to be single sourced. This code can be used on both of the platforms, since it does not cause any errors anymore. Where to register wrapped code? The preferred way is a separate plugin to host the code. When running on RCP, you will have to make sure that this plugin has been started. On RAP, you would just exclude that plugin from deployment. The other way around is valid as well. Where to find the sources? You can checkout the sources from http://erdalkaraca.googlecode.com/svn/trunk/org.eclipse.labs.singlesrc.